Which is your favourite UK series D banknote ? 9 July 1970 (Series D debut with £20 note) to 20 Sept 1996 (withdrawal of £50)/ 20 May 1993 (withdrawal of £20) - £50 wasn't and still isn't an "everyday" note. 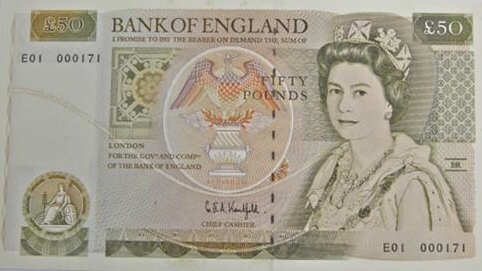 Used on every legal tender note in circulation from 1 June 1979 (last Series C notes withdrawn 31 May 1979) up until 7 June 1990 (debut of Series E with £5 note). They were the UK's first "thematic" set of banknote designs, which were the work of Harry Ecclestone. I'm very fond of these designs and quite nostalgic about them. The images are copyright of Pam West, who is an established and respected dealer of banknotes. See the relevant page from her web site here. Re: Which is your favourite UK series D banknote ? It's so hard to choose that I've voted for them all equally. In reality, I'm a tiny bit less enthusiastic about the Shakespeare scene. The era and style of 1660s (and thereabouts) England appeals to me a lot, so I'm especially fond of the Wren and Newton portraits. Wellington and Nightingale are distinctive designs too. The London scene on the 50 pound note is a favourite. Yes, I can’t decide either, so have gone for all equally. I don’t think I ever saw a £50 from this series but it’s quite a good design. This is what banknotes look like! This series is the first I encountered (apart from the £1 as series D didn’t appear until 1978 for that one). Therefore, it’s immortal. Every series since I’ve tried to compare unfavourably with this one. The obverse sides are quite interesting too. Same portrait but the Queen is dressed differently in each, I think. Interesting that the £1 differs in that it has no “£1” or “1 Pound” at the top. I was wrong, only two lots of clothes on the notes issued, but would have been three had the 50 Pence note joined them (though it’s only her headgear on that that’s different from the £1 and £5). But the amount shown varies slightly, even with the same set of clothes. The St George figure on the 20 pound obverse is rather simplistic. Not keen on that one, tho. In general I do think the designs are superb, tho, and I do like the colours too. They're very detailed, more so than most coins, yet he got the amount of detail just right too, even on the obverses, which would have been harder to judge. I don’t think I ever saw a £50 from this series but it’s quite a good design. Superb design. I deliberately got one from the bank to admire but rebanked it some years later.